Happy Weekend my friends! Hope you are having a great silly season - it's in full swing at our house. 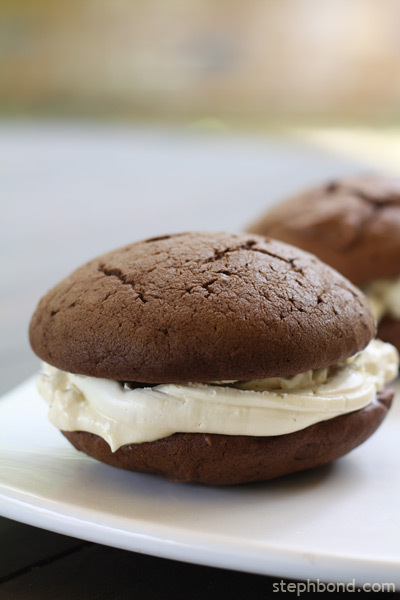 This week I finally made whoopie pies (after my post about them back in May) for our little friend Archie who turned One. And let me tell you... they were INCREDIBLE. I used the The New York Times recipe (buttercream filling instead of dubious marshmallow + synthetic mystery ingredients filling) and we all thought we had died and gone to sweet things heaven. I'll have to find a better buttercream recipe as this one required taking the egg + sugar mixture to 180 degrees in a double boiler and then whisking until cool etc etc.. fiddly. But give it a go - they suited Archie much better than cupcakes and apart from the filling, were easy to make. Let me know if you do! Only two weeks until Christmas and I hope you've been getting the most out of the Australian Christmas 2010 series. From your comments, it sounds like you have been picking up some goodies. Another congrats to Kate for winning the Polli Christmas Wreath giveaway this week - lucky thing. And a shout-out to the Finders Keepers gals for featuring my top picks for kids on their gorgeous blog. oh yum yum yum you made them!!!!! !